Epioni in a few lines? EPIONI supports all informal carers in Greece. The organisations provides information and raise awareness about the significant contribution made by carers to the Greek health and social care system and the economy as a whole. EPIONI seeks to ensure to safeguard this contribution to the Greek society. The organisation monitors national policies to make sure thei take carers into account, i.e. promote their social inclusion, the development of support services, enable them to remain active in paid employment and maintain a social life. EPIONI provides information for Caregivers about their rights through the organisation of workshops and conferences. The organisation also organises a summer camp for people with mental health problems and their caregivers as well as activities promoting psychosocial rehabilitation for people with mental health problems. What are your priorities ? 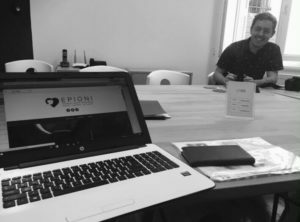 EPIONI is a fairly new organisation in the process of building strong partnerships in Greece and in Europe. EPIONI is interested in collaborating as part of EU projects such as Erasmus+.